that I might have a slight addiction to craigs list. and don't ever plan on buying another piece of new furniture again. Okay, maybe a mattress. I'd probably buy a new mattress. That being said, for the most part I make out pretty well. But recently I did have my first craigs list FAIL. Let's just say I won't be sending my husband to pick up items alone anymore. I definitely wouldn't have bought it. Unfortunately, he didn't know any better. But fortunately, I was able to turn right around and sell it again with a loss of only about $5. My most recent purchase and project was a new stand for our tv. which completely dwarfed our pathetic garage sale, terribly painted (on my part) current tv stand. The kids had also beaten it to hell which didn't help its lacking aesthetics. where it can endure more abuse from the children. which was a step up from the CHAIR our tv sat on when we first got married. I have been looking for months for just the right piece and knew exactly what I wanted. but I still ended up paying more than I had planned. BUT. It was exactly what I wanted and it was in great shape. but what I keep telling myself is that it's important to make your home "you", right? ...especially ones that smell like old ladies. 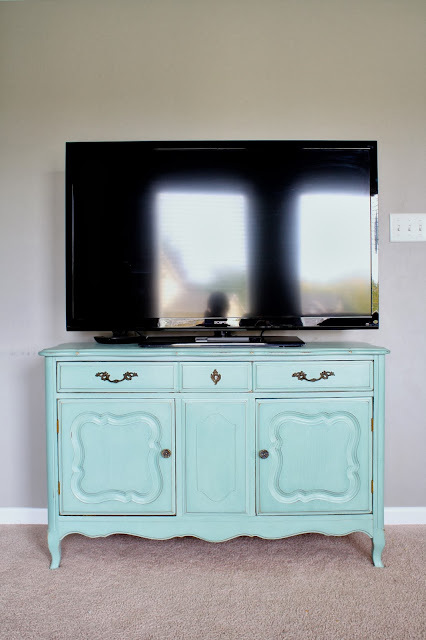 I decided to try out this whole chalk paint phenomenon swirling around the blogosphere. and another friend and blogger redid her living room tables. and decided to make my own homemade chalk paint. I honestly and truly love it. even though I haven't quite figured out an arrangement that doesn't look awkward. our wii, dvd player, remotes, equipment, dvds, etc. with plenty of room to spare. which left white clumps on the furniture. - I used Plaster of Paris for my paint but I believe the best product to use is calcium carbonate. - I don't love that after 2 coats and lightly sanding, I could see my brush strokes. I think it turned out AWESOME! I think painting wood, even real wood does make it more you and that IS what a home is all about. You don't have to follow others rules just because they know what's right or wrong! This is hilarious, because I just spent about 4 hours tonight combing through craigslist, looking for a dresser that I need to try some chalk paint on! Ha! I'm glad I'm not alone in this. Now, that is pretty much the size and style I've been looking for with not much luck...I went through all 1,800+ entries of "dresser." :) Wish me luck!